On a whim, he pitches himself as a guest on her popular TV show, and the two embark on a whirlwind courtship. But relationships require a delicate balance of nurturing and belief, much like winemaking. 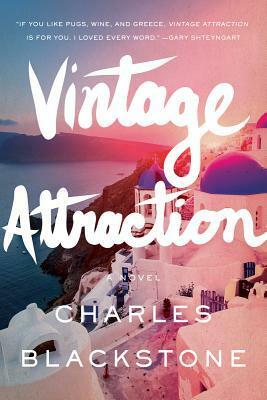 Hapworth and Izzy must navigate the complex mysteries of wine--and the heart--from glamorous social events and domestic travails in Chicago to the vineyards and rocky bluffs of Santorini in Greece. Thank you so much for choosing Vintage Attraction! I just finished The Truth About Alice and really enjoyed it. Looking forward to reading a beachy read next! Wit so many wonderful authors and books in this world, who can choose a favorite?!? I review books, so I' constantly reading all different genres and nonfiction. I have collections of short stories for horror that I plan to read. My favorite summer read is a romance set in the tropics. I like to be able to feel the sunshine! I don't have a favorite summer read--but I do like to read thrillers more during the summer time. Anything that is Fantasy, Paranormal, Dystopian, Science Fiction, Etc. This summer I will be reading Daughter of light by V.C.Andrews. I don't really have any particular book that I prefer for summer, but I do prefer to read lighter books during the summer. I love On the Island. I love any kind of reading almost. It can be anything light to heavy as long as it reads well. I don't really have any favorites. I read whatever is handy. I love reading most book genres, but I always read my favorite book-Pride & Prejudice at least once a year-usually at the beginning of summer. I love reading Elin Hilderbrand's books during the summer. They all take plan in Nantucket so they are very beachy and summery! I'll be reading the girl with the dragon tattoo this summer =) and rereading a few old time faves too including alice in wonderland!